Reduce downtime and increase productivity: avoid unexpected downtime and make more informed decisions about maintenance schedules by detecting problems early before a failure can occur. Visualise data and alarms: HMI clearly displays alarms and graphs of raw vibration data along with baseline, warning and alarm values. 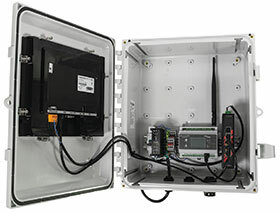 Local and remote monitoring: access raw data right on the HMI or via the cloud from any network accessible location. • Identify machine performance issues caused by misalignment, unbalance, bearing failures, pump cavitation, blade damage, etc. • Identify equipment requiring full spectrum analysis. • Establish more strategic scheduling of equipment maintenance www.youtube.com/watch?v=id0-qrhviso.